Use lots of ring markers (or contrasting yarn markers)! Ring markers help by making it easy to check to see if I did each stitch required for the repeating pattern, but they are sort of a hassle. They fall off all the time, and I feel like they make the loop bigger in the stitches they are in between. I’ve tried yarn markers in another project and that turned out ok, I’m going to try it with this too, but haven’t done so yet. Add life-lines at a regular interval in the project, so that if you realize a mistake was done several rows deep, you can frog to the closest life-line without worrying about dropping stitches. 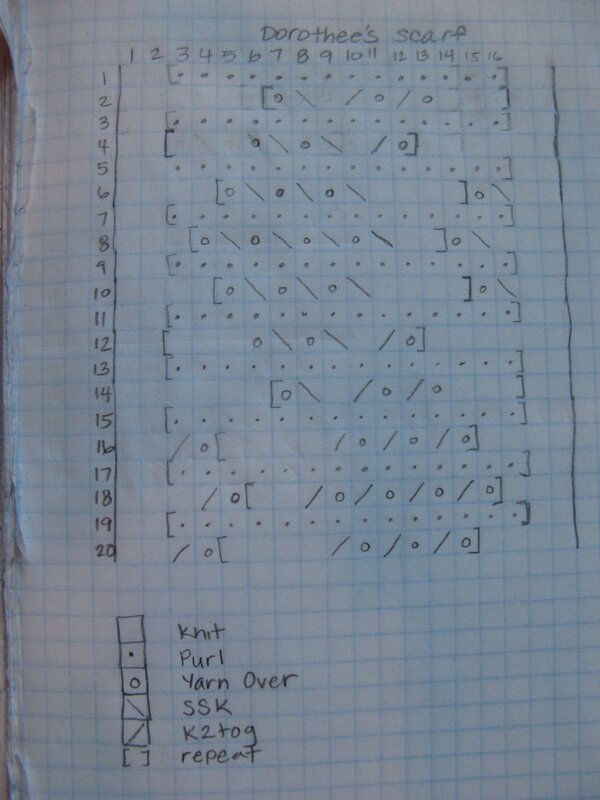 The chart doesn’t do the pattern justice, it’s an exquisit looking project, I just love it. I wish it was easier, but I’m learning a lot. And, the fact that I put it down and worked on some new more difficult socks and then picked it back up has helped a lot. Can’t wait to finish it and block it though!!! You are such a little over achiever w/ your lacey project. PRetty soon you'll be knitting racey undergarments. Lifeline sounds very cool…could use that in general in life. Maybe we need a sock night class sometime soon? If not, I'll never make that 2nd sock and my other foot will get cold this winter. Yes! Let's do the next sock night definitely. That would be the 24th right? Is it every 4th friday?